Can you believe it’s 2016 already? 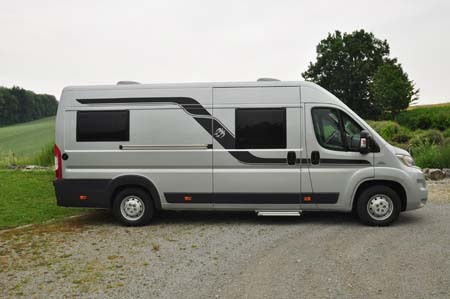 It certainly is as far as motorhome manufacturing is concerned, with plenty of new season models already arriving at dealerships throughout the country. Here’s one early contender for closer investigation, especially if you want a van conversion that offers the kind of comfortable sleeping that only a permanent bed can give you. Germany’s Knaus (pronounced k-nous) has its eyes fixed firmly on the UK prize. It’s the number one motorhome brand in its homeland, and all the signs are it’s about to take our country more seriously. Watch out for more dealer appointments, for starters, as it looks to give a higher profile to a range that goes from van conversions all the way through to A-class liners. Interestingly, all are based on Fiat’s ubiquitous Ducato. BoxLife is a new line-up of van conversions that undercuts the current BoxStars in terms of price. Look out for three BoxLifes, initially, one each on the medium, long and extra long versions of the Ducato van. It’s the 630 ME here that tops the list, at 6.36m, and it’s the rear sleeping arrangement where Knaus offers something a bit different. Two can sleep side-by-side, lengthways, on the permanent bed at the back. But, that bed section can also be ordered with a raising function. That means, when you want the bed out of the way, it can be raised manually (or, for additional cost, electrically) thus clearing the way for storage of all kinds of items, including bikes – or, you might just prefer the extra floorspace. 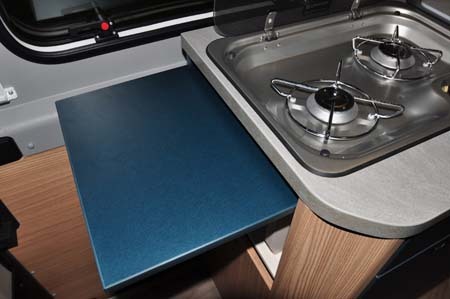 And, although it’s a two-berth initially as far as sleeping is concerned, there will be a rather clever drop-down roofbed option that goes over the lounge. 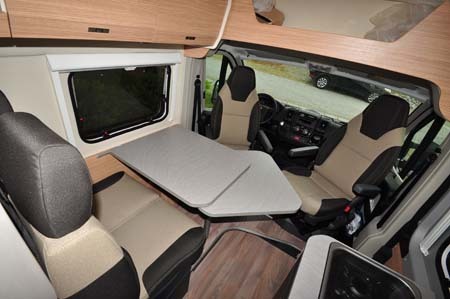 The rest of the layout is straightforward, with kitchen and washroom centre-‘van and a four-seater lounge – both cab seats swivel to face the rear travel seat around a table that comes with a handing swivel-out extension. The kitchen is basic (two-ring hob, separate sink, but no space for a grill/oven), although there’s some neat storage here and the fridge, a compressor model, offers a generous 90-litre capacity. The washroom opposite certainly tries to offer the expected showering and toileting facilities. No problems with the latter, but the wrap-around curtain for the former won’t make things easy, despite inflatable tubing (a feature that’s finding its way onto an increasing number of washrooms where shower space is tight) that’s supposed to give it some structure. 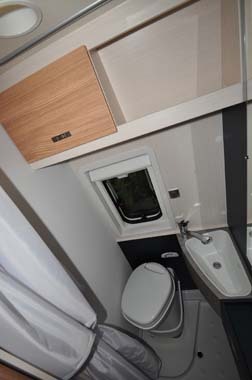 Nevertheless, plenty of contemporary detail touches throughout – the furniture finish, LED lighting, a good array of storage (including plenty of drawers) and – a particularly neat touch – rear seats that can slide apart for travel, all help this Knaus add up to a very interesting proposition. The vehicle photographed here is the continental version, but the overall format won’t change for the UK (apart from the steering wheel switching sides, of course). What will be different, however, is the overall specification. 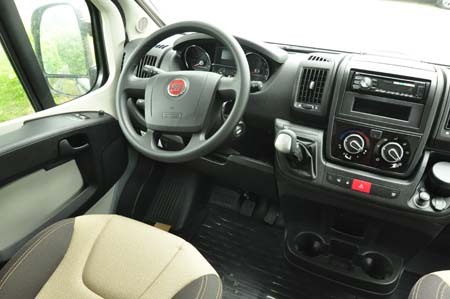 It’s not been fully confirmed, but it seems UK versions will offer items ranging from the Fiat Pack (electric, heated door mirrors, cab air conditioning, passenger airbag, cruise control and height-adjustable cab passenger seat) to the Life Pack (electric step, Remis cab blinds, radio preparation and speakers, washroom window) to a Styling Pack (colour-coded front bumper, alloy wheels, aluminium skid plate, black-framed headlamps, black radiator grille, LED running lights). 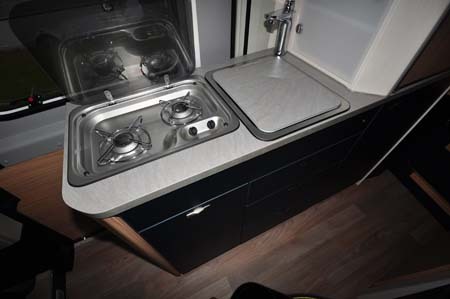 Detail upgrades will also include Truma Combi heating with electric as well as gas operation, padded steering wheel, silver dashboard vents trim, reversing sensors; heated waste water tank and floor carpeting. All that remains to be confirmed are final prices, both for the vehicle and optional extras. But, the early signs are these are going to be highly competitive. There’s more information on the BoxLife 630 ME on the Knaus website (www.knaus.de). To find out more about our low-cost premiums visit the motorhome insurance discounts page. lovely comfortable bed, but don’t like the rest of the interior which, though nicely finished off, seems far too cramped for comfortable days when you simply just want to chill out inside. The washroom shower curtain isn’t an ideal feature – a screen of some sort would have been better, and having no oven makes it a no sale as far as I’m concerned. Sorry, but my smaller Fiat Sundance is far superior, even though the bed is a simple pull-out.